After years and years of being a staple in the Nitro boot line-up, the Team TLS Snowboard Boot is considered to be the most versatile boot on the market - designed to push team rider standards. 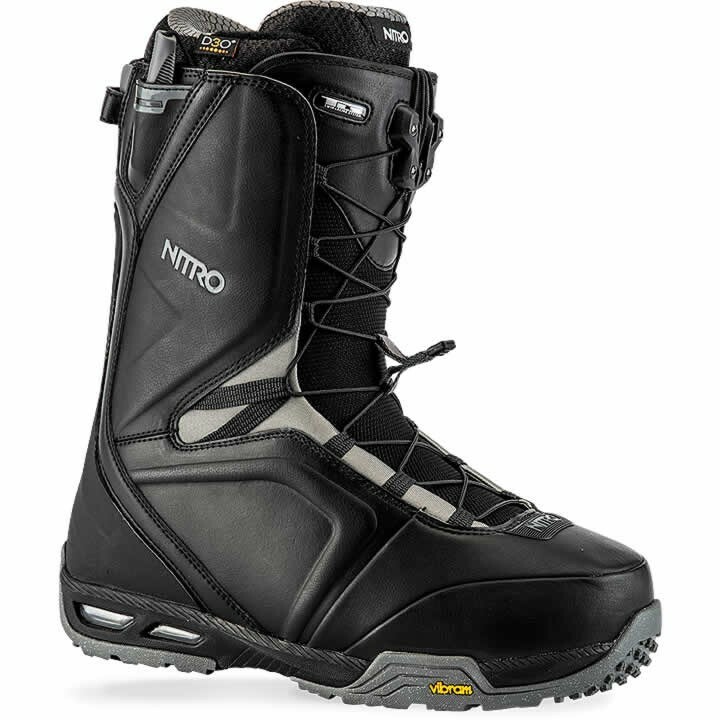 This team favorite has become Nitro's most iconic boot because every season Nitro sets out to push the standards of what an all-mountain boot should be - it should be a boot that outperforms in every condition or type of terrain. The Vibram® IceTrek Outsole and Armored Spine provide unparalleled durability and sure foothold on and off the board. The OrthoLite® Dual Density Footbed in the D3O® Enhanced Cloud 9 Liner provides all day comfort and foothold, because of Nitro's new RE/LACE Liner Locker that gives you the option to retighten your liner on the chairlift with ease. Austin Smith, Marcus Kleveland, and Eero Ettala love this boot because it provides, stability, comfort, response, and keeps their feet warm all day with the Therminator Shield. Built for individuals and built to progress - the Nitro Team Snowboard boot. Response 8/10 - This is basically your boot's stiffness. The higher the number, the stiffer - and therefore more responsive and carveable - your boot will feel. Freedom 2/10 - This shows how flexible boot is in both medial and lateral directions. A higher number means more tweaks! Comfort 9/10 - Higher numbers here refer to more plush and cush in lining, footbed and outsole. But also a softer boot is more comfortable automatically. D3O® Enhanced Cloud 9 Liner - D3O is a smart material that moves slowly and increases comfort when in a normal state, but when shock or impact is increased the materials lock together to absorb and disperse energy created upon impact, before instantly returning to its flexible state. What this means is that the material increases overall comfort of the liner by absorbing impact from deep landings or choppy snow conditions - allowing you to go faster and deeper all day! Flex Link Design - A flexible panel between upper and lower shell ensures an even flexing, responsive boot without bulk. TLS 5 Twin Lacing System - Leading the pack with the TLS 5 lacing system: Easy lace engagement and release, combined with the low abrasion of Nitro's Dyneema® laces are the key factors of this highly reliable zonal lacing system. At the same time, the TLS 5 features compact size and low weight while maintaining the reliability proven by tens of thousands of days on the mountain. Even though rarely needed, servicing and replacement of all parts including the lace is easier than with any other system on the market. Even using a standard lace if you're in a pinch is an option only available on Nitro's TLS boots. Easy-entry handle storage pockets as well as Nitro's Bail Out system for an easier entry and exit round off the most developed dual lacing system on the market. Bail Out System - Designed to make unlacing the TLS system even easier. This pull tab that is placed in the middle of the TLS lacing system on the outside of the boot allows for effortless unlacing and recording breaking speeds for taking your boots off. RE/LACE Liner Locker - Another innovation from your friendly developers at Nitro: The RE/LACE Liner Locker provides easy adjustability of your inner boot lacing when your boot shell is already tightened (tied), by just pulling up on the lace handle. This allows you to (re)tighten your liner and foothold throughout the day (on and off the chairlift) without having to untie you boot. Vibram® IceTrek Outsole - Developed to provide improved grip on icy and snow surfaces, the Vibram® IceTrek compound allows you to move freely and safely in cold climates. Vibram® IceTrek compound will not scratch or damage interior floors or absorb liquids or dirt, while offering grip and traction on icy surfaces. Usable in all seasons, it represents the best solution for every condition encountered from the Equator to the North Pole. The softness allows the compound to adhere to smooth surfaces and Nitro's advanced sole design utilizes small pointed lugs and a large supporting surface for improved traction and durability.